I was looking through some of my old geologic photos and found this one which is an excellent of colluvium. One look at this and it is obvious what colluvium is, but I anotated it because there is more to it than meets the eye. This picture was shot in western Wyoming 30 years ago. 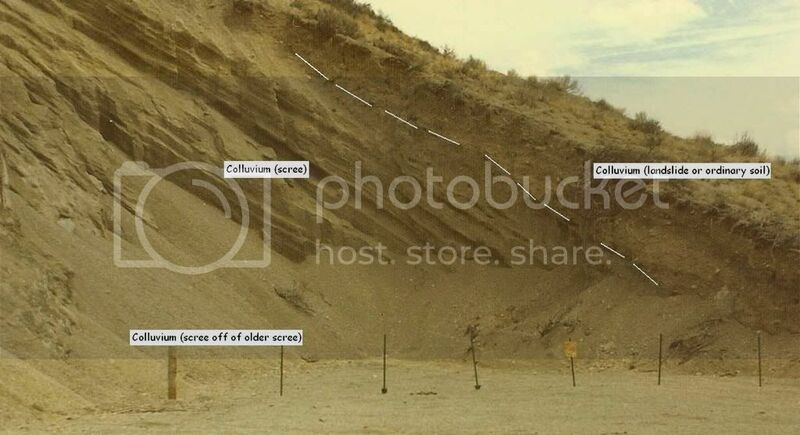 You may be asking why the scree material is different from the landslide/soil material? Good question! The scree is clean and loose, so I believe individual piece slid and rolled down the mountain side probably during a drier climate. Maybe wind and frost got the pieces off the outcrop, then gravity took them from there. Note the scree deposit off the older scree. The soil/landslide on top of the scree also slide down the slope perhaps due to a wetter more recent climate, or simply as a result of a prolonged rainy spell. You will never see large steeply dipping bedding like this in alluvium (water deposited sediments). Re: What exactly is colluvium? Colluvium........is the name for loose bodies of sediment that have been deposited or built up at the bottom of a low-grade slope or against a barrier on that slope, transported by gravity.........Scree......also called talus, is a term given to an accumulation of broken rock fragments at the base of a mountain or cliff.